Culture : Ways of living change as humans interact with each other. 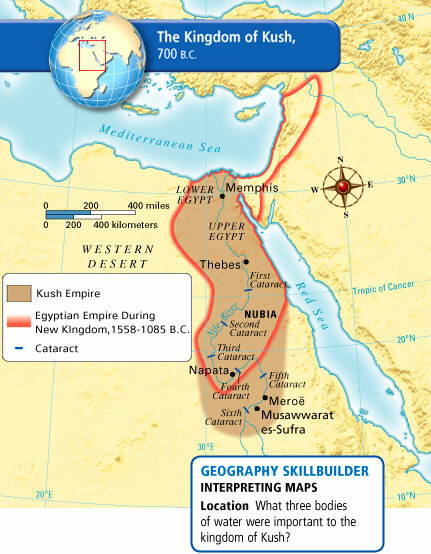 Kush civilization was influenced by Egyptian culture. Kush was under the rule of Egypt for hundreds of years. Kush adopted Egyptian customs, religion, hieroglyphs, and architecture. Later, Kush conquered Egypt. The two cultures influenced each other. Build on What You Know Have you ever traveled on a river or visited a river town? The Egyptians lived downstream on the lower, or northern, end of the Nile River. Now you will learn about another culture that developed to the south that interacted with Egypt and other parts of Africa. ESSENTIAL QUESTION In what ways were Nubia and Egypt connected? Nubia (NOO•bee•uh) is the name for a geographic region of Africa. 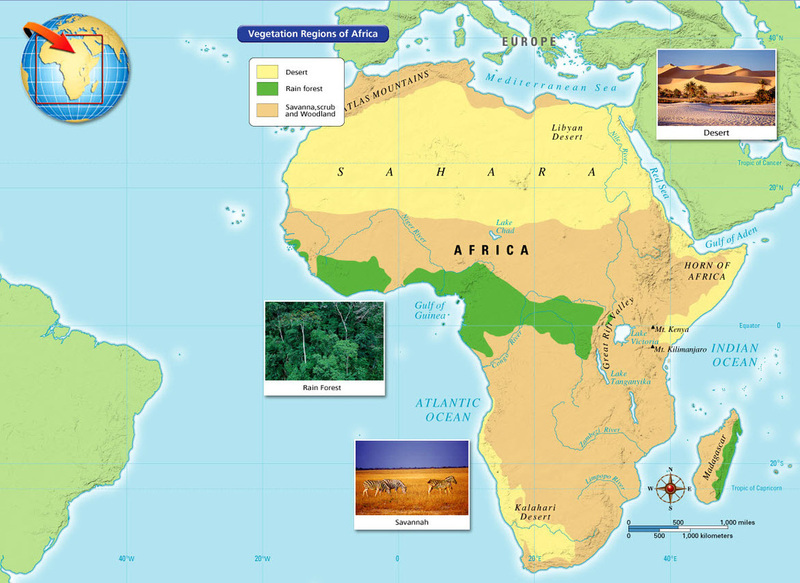 (See the map of The Kingdom of Kush.) Nubia extended from the southern boundary of Egypt southward to include present-day Sudan. Its southern boundary was south of the Nile River's sixth cataract. Upper and Lower Nubia Like Egypt, Nubia was divided into upper (southern, upstream) and lower (northern, downstream) areas. Like the Egyptians, the people of Nubia lived along the Nile. However, in southern Nubia, unlike in Egypt, a climate that provided greater moisture meant farming was not limited to the Nile valley. ESSENTIAL QUESTION What were some of the achievements of Piankhi? Egypt controlled parts of Nubia between 2000 and 1000 B.C. During these centuries, Nubia was a source of goods for Egypt. But as Egypt declined, a Nubian kingdom called Kush became a power in the region. In ancient times, Nubia had a strong influence on Egypt. For example, some scholars believe Nubia's monarchy was the earliest in human history. Later, this monarchy was developed in the person of the Egyptian pharaoh. Then, when Egypt ruled Nubia, the Egyptian pharaoh appointed an official to govern the region. Contact with Egypt resulted in cultural exchanges. Egypt influenced the art and architecture of the Nubian region, including the emerging kingdom of Kush. Nubians also worshiped some of the gods sacred to Egyptians. Young Kushite nobles went to Egypt where they learned the Egyptian language. They also adopted the customs and clothing styles of the Egyptians. They brought back royal rituals and a hieroglyphic writing system to Kush. Egyptian pyramids were also adapted by builders in Kush. In the 700s B.C., the Nubian kingdom of Kush conquered all of upper and lower Egypt. In 751 B.C., Piankhi (PYANG•kee)—a Kushite king—attacked the Egyptian city of Memphis. By about 36 years later, Piankhi had gained control of Egypt. From this point on, two periods make up the history of Kush. Each period is based on the location of the capital and king's tomb. The city of Napata was the capital during this first period. Meroë (MEHR•oh•EE) was the capital during the second. Piankhi united Egypt and Kush. Nubia established its own dynasty, or line of royal rulers, on the throne of Egypt. Piankhi was declared Egypt's pharaoh. His reign marked the beginning of Egypt's 25th Dynasty. Although he was the pharaoh, Piankhi did not live in Egypt. Instead, he chose to live in Napata, the capital of Kush. Napata was located at the head of a road used to move goods around the Nile River's cataracts. Traders used the road when boats loaded with goods were unable to navigate the rough water on certain sections of the river. Nubia was rich in goods that were scarce in Egypt: ivory, animal skins, timber, and minerals. This led to a lively trade along the Nile. Napata was the center for the spread of Egyptian goods and culture to Kush's other trading partners in Africa and beyond. Taharqa (tuh•HAHR•kuh) was a later Kushite ruler of Egypt. Taharqa spent much of his reign fighting the Assyrians, who had invaded and conquered Egypt in 671 B.C. The Assyrians carried iron weapons that were more powerful than the bronze weapons of the Kushites. A large part of the Assyrian army was made up of foot soldiers, who were armed with bows and arrows. Piankhi was a Kushite king who knew when to fight and when to make peace. When a Libyan chief threatened Upper Egypt, Piankhi decided to fight. He defeated the Libyans' land army and their river fleet as well. At the time, Egypt had many weak princes who ruled small areas. They welcomed Piankhi's protection. The Egyptian priests also were eager to have Piankhi come to their defense. Around 750 B.C. Piankhi united Egypt and became the pharaoh. This marked the beginning of the 25th Dynasty. Having accomplished what he set out to do, Piankhi went home to Napata. There he had a stone slab built that celebrated his deeds. The slab lasted longer than his dynasty, which ended after about 100 years. 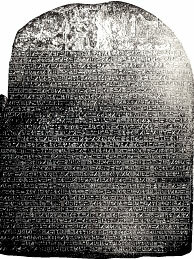 Monument - This black granite monument, which is six feet high, was discovered in Napata. The image of Piankhi is at the center, upper right. Some Assyrians drove chariots. The Assyrian army also was the first army to have a cavalry—men on horseback. The Kushite armies under Taharqa were no match for the Assyrians, who took control of Egypt and parts of Kush. After their defeat, the Kushite kings retreated south. 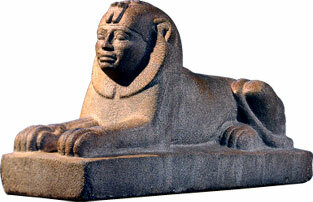 Sphinx - This granite sphinx of King Taharqa comes from the Amon Temple at Kawa and dates from about 690 to 664 B.C. ESSENTIAL QUESTION Why was the Kushite city of Meroë an important economic center? The Kushite kings eventually chose a new capital, Meroë, in about 590 B.C. Meroë was located on the Nile and on trade routes leading from the Red Sea to the interior of Africa. It had access to gold and iron. The defeat of Kush by the Assyrians taught the Kushites that they needed iron weapons. The people of Kush learned to smelt iron. Smelting is the heating of material from Earth's crust to separate the elements it contains. The Kushites mined rock containing iron ore. Then they heated the rock in small earthen furnaces. The heat caused the iron to separate from other minerals. Meroëwas an ideal location for producing iron. The city was close to iron ore deposits. The Kushites set up smelting furnaces to process the deposits. Meroë traded its iron in central and east Africa, and in Arabia. Ivory, gold, and products made from them were traded at Meroë. These items were in demand in many other parts of the world. Trade was especially active with Egypt, which was under Greek rule beginning in the fourth century B.C. Some of the gods worshiped by the Kushites in Napata and Meroë were similar to those of Egypt. This similarity was especially true of the sun god Amon-Re and Isis, goddess of the moon. Other gods were Nubian in origin. In Nubia, women played an important role. Amanirenas and Amanishakheto were important Nubian queens. Queen Amanitore and her husband ruled beginning around 12 B.C. The people of Kush developed a written language. They appear to have at first used hieroglyphics similar to those used by the Egyptians. Later, their language changed to an alphabet of 23 symbols. The language has not yet been translated. Royal tombs in Kush were built of stone. They were pyramid-shaped with steep sides. These tombs included a chapel attached to the side. Kushite kings were often mummified to preserve their bodies. These traditions continued in Nubia even after they had died out in Egypt. Armlet - This armlet dates from Meroë in the late first century B.C. It is made of gold with fused-glass inlays. On the hinge is the figure of a goddess. • Nubia and Egypt interacted with each other. • The Kushite king Piankhi conquered Egypt. • The Kushite capital of Meroë was a trade center. By studying the history of Nubia, we learn of the important role played by Africans in ancient history. The Kush Empire was a center of trade. As the mineral wealth of the Nile valley flowed out of Kush to Egypt (among other places), luxury goods from India and Arabia flowed in. 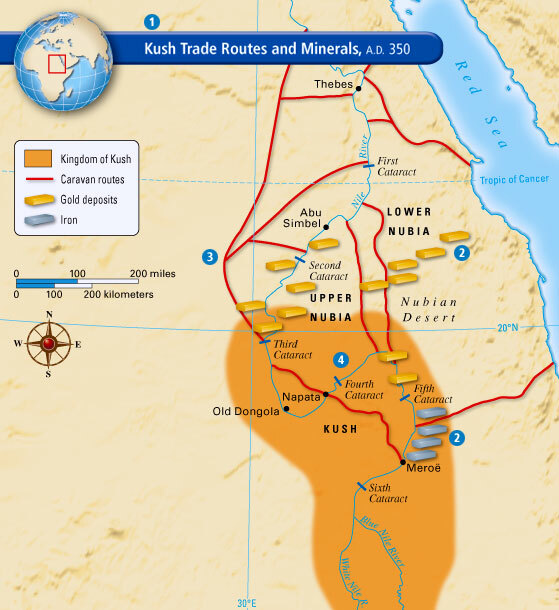 Trade routes developed both over land and by sea to carry goods in and out of Kush.